This digital gallery is a tribute to the victims and survivors, and represents the continuous love and support received from across the region, country and world. The Orange County Regional History Center and Orange County Government is pleased to share this online gallery with you. The Orange County Regional History Center and Orange County Government are pleased to share this online gallery of memorial items with the world. The gallery is intended to help capture the stories behind the artifacts and will expand as curation efforts continue. The One Orlando Collection | Conserve. Preserve. Remember. The Orange County Regional History Center continues to collect, conserve and catalog artifacts to honor the Pulse Nightclub tragedy. Memorial collection sites include Pulse Nightclub, Dr. Phillips Center for the Performing Arts, Lake Eola, and the Orlando Regional Medical Center. 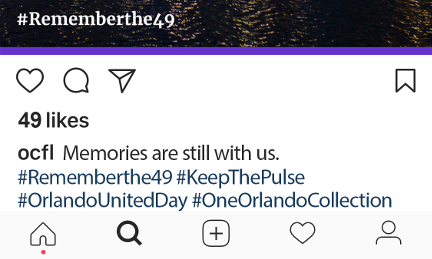 Collecting items associated with the Pulse Nightclub tragedy makes them available for future commemoration, education, exhibition, and scholarship. We thank you for sharing your memorials, photographs and stories with us as stewards for the history of the Orlando community and beyond. The One Orlando Collection Initiative is a partnership between Orange County Government and the City of Orlando with assistance and input from numerous community stakeholders and partners. The gallery is intended to help capture the stories behind the artifacts and will expand as curation efforts continue. To preserve items, the Orange County Regional History Center is regularly photographing, cataloging, removing and conserving tribute items from public memorial sites throughout Central Florida to be available for the community for years to come. The One Orlando Collection will expand as curation efforts continue.